Calculating and documenting the Internal Revenue Code Section 41 Credit for Increasing Research Activities (“Research Credit” or “R&D Credit”) is an intricate and often burdensome undertaking. This process is complicated during the throes of busy season. Fortunately, the Internal Revenue Service (“IRS”) has afforded taxpayers additional time to claim a R&D credit via making a “Protective” 280C(c)(3) election on a timely filed return (including extensions). The Section 41 Research Credit was enacted in 1981 as a temporary code section and made permanent with the passage of the Protecting Americans from Tax Hikes (“PATH”) Act of 2015. The research credit is an incentive providing taxpayers across all industries, performing qualified activities, the opportunity to reduce their tax burden. For an activity to qualify for the research credit, it must meet all the requirements as described in Section 41(d). Section 41(d) defines “qualified research” as expenditures that may be treated as expenses under Section 174, which are undertaken for the purpose of discovering information that is technological in nature, and the application of which is intended to be useful in the development of a new or improved business component of the taxpayer, and substantially all of the activities of which constitute elements of a process of experimentation. Sec. 280C(c)(1) requires taxpayers to reduce their Section 174 deductions by the amount of Section 41 research credit claimed for the tax period thus preventing a double benefit related to the R&D credit (i.e., expense & credit). For example, a C Corporation with taxable income of $100 million generates a gross R&D credit of $10 million and does not make the Section 280C(c)(3) election for the 2018 tax year. The C Corporation is required to add back the $10 million to taxable income. As such, the C Corporations tax liability is calculated as follows: $110 million multiplied by the applicable 21% corporate tax rate resulting in a tax burden of $23.1 million. After applying the $10 million research credit, the C Corporation’s final tax liability is $13.1M. Section 280C(c)(3) provides taxpayers the ability to elect a reduced R&D credit in lieu of adding back the Section 174 research expenses as promulgated under Sec. 280C(c)(1). The reduced credit is the product of the gross Section 41 credit and the maximum rate of tax pursuant to Section 11(b) (i.e. 21%). A valid Section280C(c)(3) election to take a reduced credit must be made on a timely filed return (including extensions). It is important to note; the election is irrevocable and only applies to the tax year in which it is made. Following the same fact pattern outlined above, except the C Corporation makes the 280C(c)(3) election to claim reduced credit. The reduced credit is the product of the $10 million research credit generated and the maximum rate of tax for Corporations of 21%, resulting in a reduced credit of $7.9 million. In this scenario, the C Corporation is not required to add back the $10 million to taxable income due to the 280C(c)(3) election. As such, the C Corporations tax liability is calculated as follows: $100 million multiplied by the applicable 21% tax rate, resulting in a tax burden of $21 million. After applying the reduced credit of $7.9 million, the C Corporation’s final tax liability is $13.1M. KBKG Insight: Tax Cuts and Jobs Act (“TCJA”), signed on December 22, 2017 by President Trump, reduced the maximum corporate tax rate to 21% from 35%. As a result, the “net” R&D credit benefit available to taxpayers will increase. Independent of other considerations, taxpayers subject to the highest corporate tax rate will not see a change in tax liability via the Section 280C(c)(3) election (as demonstrated in the two scenarios above). However, depending on the specific facts and circumstances making the Section 280C(c)(3) election may become critical. The IRS has contemplated Section 280C(c)(3) elections multiple times in the past. A taxpayer who failed to make a timely election for the reduced research credit under I.R.C. § 280C(c)(3)(A), avoiding the correlative reduction in otherwise deductible expenses under I.R.C. § 280C(c)(1) and (c)(2), is precluded from making such an election on an amended return/claim for refund. A valid section 280C(c)(3) election can only be made by actually computing and claiming the reduced (13%) credit on taxpayer’s original, timely filed tax return. Taxpayer cannot make a valid election without claiming the credit, by merely writing the words “280C”, or by making a statement on the original tax return that taxpayer elects section 280C in the event that they later determine that they have research credit. If the taxpayer files an amended return claiming the reduced credit under section 280C(c)(3), when they did not claim credit at the reduced rate on the original timely filed return, the election is invalid and the claim should be returned to taxpayer to correct. A taxpayer that clearly indicates its intent to claim the reduced credit by noting on the Form 6765 attached to its timely filed an original return for the taxable year “section 280C” next to the line on which the current year reduced credit could be claimed or by claiming a nominal credit amount along with the “section 280C” notation has satisfied the requirements under §§ 280C(c)(3) and 1.280C-4(a). Such notations clearly signify that the taxpayer has made an affirmative election to claim the reduced credit. The final 280C(c)(3) regulations specifically contemplate the “Protective” 280C election regardless of whether any research credits were claimed. Provided the taxpayer clearly indicates intent to make the Section 280C(c)(3) of the Form 6765 on the original timely filed return (including extensions), the taxpayer may claim reduced credit in the future. As claiming and substantiating the research credit can be a complex and laborious process, the Protective election may be an invaluable solution. There are multiple areas to consider during the annual tax planning process to consider in deciding whether to make a Protective 280C election. Due to Section 38 rules on the credit utilization, taxpayers were generally unable to reduce their tax liability below the Alternative Minimum Tax (“AMT”). Many conduit entities with partners or shareholders in AMT would not benefit from the R&D credit. Furthermore, taxpayers in an AMT position who did not file the R&D credit on a timely filed return (including extensions) were required to amend historical tax returns to take advantage of the benefit. Unfortunately, the amendment of tax returns, for taxpayers in AMT, for the research credit often increased tax liability due to the Section 280C(c)(1) add back of Section 174 expense in the amount of credits claimed. A “Protective” 280C(c)(3) election allows taxpayers in this position to avoid the Section 174 expense add back and claim the R&D credit without incurring additional tax liability. KBKG Insight: It is important to note, for tax years beginning after December 31, 2015, The PATH Act allows for Eligible Small Businesses (i.e., $50 million or less in gross receipts) to claim the R&D credit against alternative minimum tax. Furthermore, the TCJA increased AMT exemptions for individual taxpayers which may potentially increase the R&D credit benefit. The 280C(c)(3) election also has state tax compliance implications. Many state jurisdictions begin with federal taxable income before adjusting for state-specific modifications. As the amount of R&D credit impacts the add back for Section 174 expenses, a taxpayer not making a 280C(c)(3) election would need to revise the starting point for all state tax returns which begin with federal taxable income. Effective for tax years beginning after December 31, 2015, Qualified Small Businesses (“QSB”) may qualify to use R&D credits to offset up to $250,000 of payroll tax liability. A QSB is a corporation, partnership, or individual with less than $5 million of gross receipts during the taxable year AND the taxpayer did not have gross receipts for any tax year before the fifth tax year ending with the year of the claim. The payroll benefit can be claimed for five consecutive years. Generally, a 280C(c)(3) election would decrease the total potential benefit available to offset future payroll tax liabilities. The Section 199 Domestic Production Activities Deduction was instituted in 2004 and provides a deduction for taxpayers performing domestic production activities, subject to certain limitations. In 2017, the deduction is equal to nine percent of the net income attributable to those production activities. Domestic production activities are defined as the manufacture, production, growth or extraction of tangible personal property. The pertinent limitation to the amount of deduction is 9% taxable income. As such, not making a 280C(c)(3) election will increase taxable income resulting in a higher limitation for Section 199 purposes and an increased Domestic Production Activities Deduction. KBKG Insight: The recent passage of the Tax Cuts and Jobs Act repealed the Section 199 deduction for tax years beginning after December 31, 2017. This presents taxpayers a limited opportunity to maximize the Section 199 deduction years open under the statute of limitations and prior to the repeal date. 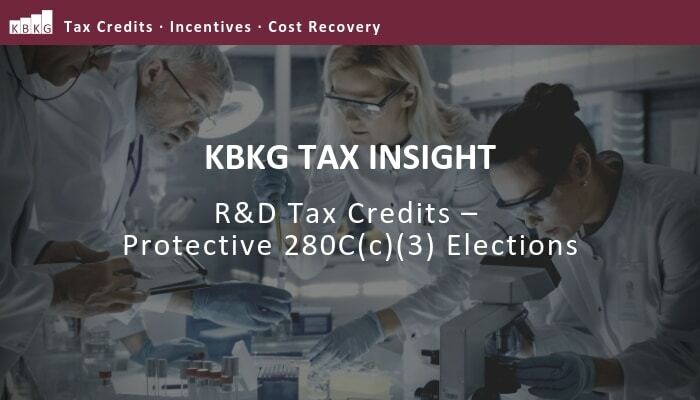 With an unrelenting busy season in addition to the intricacies associated with the calculation and substantiation of the R&D credit, taxpayers should discuss with their tax advisors the potential for making a Protective 280C(c)(3) election.